I noticed this weekend that there are two different "screw-versions" of the old NES games. As we can read on Nintendo Age, most of games have both version with 5 and 3 screws. Do the games are 100% identical in-game? For some titles, there is a huge price difference between the 3 screws version and the 5 screws one and I want to be sure. Is the only factor the rarity of each version? Or there are in-game differences between those versions ? What is the reason there are 3 and 5 screws NES games? Cartridges were originally released with five screws, one in each corner and one in the center. Later, the molds were changed so the back of the case held two male clips which hooked snuggly into the front’s “slot-B” holes. This eliminated the need for the upper corner screws and was, again, probably introduced as a cost-saving alternative. I don't think you'll be able to find any better explanation, because in the end it's really just that: Another "hardware revision". The price difference is most likely related to the age and rarity, considering the variation with 5 screws is older and got abandoned. As for the actual cartridge contents, it's impossible to say: This really depends on the actual game and despite popular believe, even classic console games were often released in one or two revisions, sometimes with bugs fixed or minor things (like some graphics) getting changed. The problem is there's no way of being sure when the program was actually updated, before, during, or after the change in case/screw design. But yes, some are different. For instance, I have a 5 screw Zelda and it lacks the "press reset" warnings present in most battery backed up games. 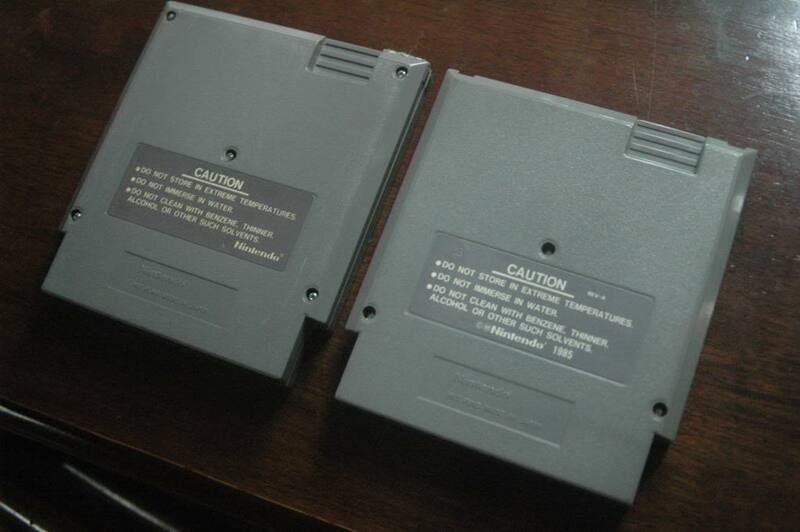 I've seen other Zelda carts that do have the warnings (in game, I mean, not just printed on the cart labels). When did the change happen? Beats me, but most 3 screws seem to have it, and 5 screws not. Although not related to 3-screw vs. 5-screw games, there is a way to see if there is a different rom on a game between two copies. According to this answer, all you have to do is check the revision number that is stamped on the caution label on the back of the cart. Each cart is stamped with 2 digits that represent an assembly line where the cart was assembled. IF nothing follows the numbers, then this is the first version of the game rom. If there is an "A", then it is the second version of the rom released to production, if there is a "B", it's the third, and so on. Regarding 5 screws, yes this was a cost savings modification. By eliminating 2 screws, Nintendo eliminated the future-need to buy literally millions of screws. Also, this would have saved time on assembly and would have allowed for more cartridges to be assembled per day. This would have meant fewer facilities and assembly lines would be needed to crank out just as many carts. Why do some versions of Legend of Zelda on the NES have the “hold reset” caution screen, and some don't?